Truth in advertising is vital in craft beer culture. There better be fresh hops in our fresh hop beers, real cherries in our krieks, and just as seasonally-relevant, real pumpkin in our field or pumpkin beers. Yet the distinguished British classic, nut brown ale, contains nary a nut. But, there are quite a few nut beers that do contain nuts. As British brown ales (Newcastle Brown Ale, Samuel Smith’s Nut Brown Ale) gave way to American brown ales from one of the earliest iterations—Pete’s Wicked Ale—to the hoppier ones that are now en vogue such, as Dogfish Head India Brown Ale, there’s a new breed a’brewin’ and they’re putting the nuts back in nut brown, porter or dunkel weisse. Nut note: not all nuts are, botanically-speaking, nuts. But since American craft brewers don’t like constraints, we’re including some that pass the culinary-nut sniff test. 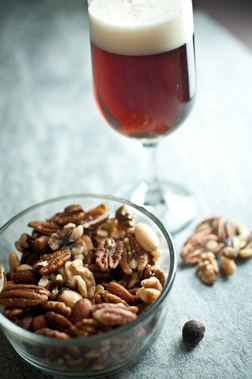 Check out these examples of nut beers from America’s small and independent craft brewers. Oregon produces nearly 99 percent of all American hazelnuts (it’s the official state nut). It also boasts nearly 150 craft breweries. Naturally, these local goodies, commonly called filberts, make their way into a few beers around the Beaver State. Stubbs Old Crow Hazelnut Porter | Alameda Brewing Co. | Portland, OR To emulate chocolate-covered hazelnuts, brewer Carston Haney procured 450 pounds of “pressed hazelnut cakes,” the by-product of Freddy Guys Hazelnuts in the Willamette Valley. While “90 percent of the oil has been removed, the flavor and aroma are retained.” This robust porter results in malty, clean taste. There was such a thing as native North American chestnuts, but blight effectively wiped them out over a century ago. Having spread from Asia throughout the world, chestnuts are so predominant in Mediterranean cuisine that chestnut flour as an ingredient in Italian beers isn’t uncommon. Gluten-free Pale Ale | Harvester Brewing | Portland, OR Harvester’s brewmaster James Neumeister began using chestnuts harvested 30 miles away at RC Farms in McMinnville as a source of barley-replacement in his dedicated gluten-free brewery. Considering their bronze medal at the 2012 Great American Beer Festival (GABF) in the new gluten-free category, I’d say it’s working pretty well. They provide intriguing character while sorghum and certified gluten-free oats provide a malty base, and even those who aren’t gluten intolerant enjoy the taste of these beers, loaded with hops (especially in their new IPA). Exit 8 Chestnut Brown Ale | Flying Fish Brewing Co. | Somerdale, NJ Chestnuts used to grow rampant in the Garden State…and aspire to again. In addition to using local honey, floured chestnuts added to the mash, and steeped roasted chestnuts in the boil work wonders before the beer finishes on whole roasted chestnuts in the bright tank. Judges awarded it bronze at the 2012 GABF in the Specialty Beer category. A perfect instance of something everyone considers a nut, but pecans are actually seeds of a drupe fruit from hickory trees. Prevalent throughout the American South, pecans are the state nuts of both Alabama and Texas (not to mention pecan pie is Oklahoma’s “state meal”). Pecan Porter | (512) Brewing Co. | Austin, TX Owner Kevin Brand saw his new winter seasonal ingredient staring at him in front of the brewery: one of Texas’s state trees. Aspiring to something “dark and delicious,” they designed a robust porter finished with pecans. Brand and head brewer Nate Seal “messed around on a couple batches” and now this beer, with organic, heavily-roasted, Texas pecans—a pound per barrel—is (512)s flagship beer, though understandably sells best this time of year. If Texas-only distribution seems limited, imagine how hard it is to find their Whiskey Barrel-Aged Double Pecan Porter. Both complement a panful of brownies. Another example of drupe seeds masquerading as tree nuts, black walnuts differ from their quotidian brethren with their added richness, smokiness, and yes, actually staining anything dark brown they come in contact with once cracked. Wymore sourced the walnuts from Hammonds, a 60-year-old family operated company in Stockton, Mo. 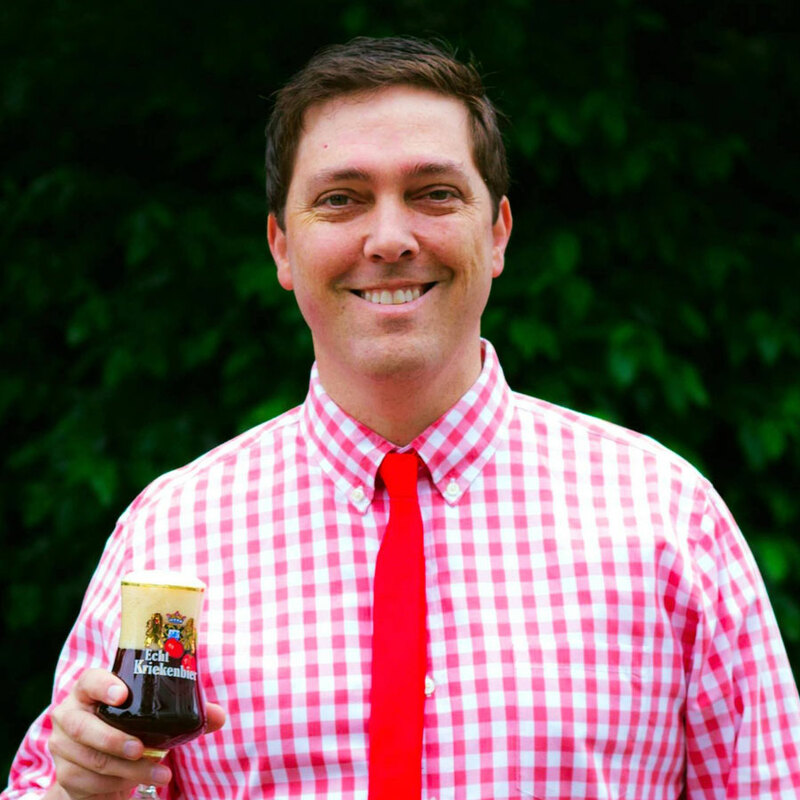 He selected a dunkelweizen as the base beer to recreate delicious banana bread with walnut flavors contributed both by the yeast, and of course ten pounds of crushed black walnuts per barrel, steeped in a mesh bag during secondary fermentation. There was some concern about oils destabilizing head retention, but since wheat beers foam up nicely, Wymore figured it would provide a counterbalance. Polish’s Black Walnut Stout | Fort George Brewery | Astoria, OR Lead production brewer Michal “Polish” Frankowicz grew up in the Midwest eating black walnuts, thus inspiring him to create a black walnut stout for the brewery’s February-long Stout Month. He transfers the beer onto five pounds of halved walnuts—“more surface area provides stronger flavor”—before adding a pound of smoked walnuts into the bright tank. Sure Italian pine nuts are delicious and make great pesto, but in the Four Corners states, particularly Colorado, there’s an even larger gift from pine trees known locally as pinyons or piñon. Though piñons actually hit their stride from late summer to early fall, this seasonal release tends to come out earlier when a smooth, toffee-like american brown ale hits the spot after a ride or hike. That’s because 100 percent of its profits go to the Friends of Cheyenne Canon to preserve and maintain the natural playground just outside the brewery’s gates. Okay, everyone knows these aren’t nuts at all, but since it’s common to find toasted coconut in a bag of trail mix made of mixed nuts, we’ll count it. CoCoNut Porter | Maui Brewing Co. | Lahaina, HI Since before the brewery opened, they’ve experimented using abundantly available coconuts, and even placed at the World Beer Cup with this beer in 2006 when it was debuted. Co-owner Garrett Marrero says they buy flaked coconut and “hand toast it in convection ovens to a deep blonde color,” ideal for extracting the true flavor over mere roastiness. In all, there’s 200 pounds per 25-barrel batch. While Marrero loves it with a variety of meats, he oozed at the memory of floating macadamia nut ice cream in it. Speaking of which, if you find yourself at the brewpub, you might be lucky enough to find Mac Nut Brown made with macadamias and cocoa nibs. Voodoo Doughnut Maple Bacon Ale | Rogue Ales | Newport, OR We wish! However, Rouge Ales is sure to clarify that no doughnuts were harmed in the making of this beer. The same cannot be said for bacon and maple syrup.